By 2012, Lolly, then six years old, had been going to the Mildred Whipple Library in Drain, Oregon, since before she was born. “I grew up here and I would always use the library,” her mother, Joy Frost, said. “And then when Lolly came along, I started taking her.” Frost was on the library board and would come home and talk about how the library’s budget was constantly on the chopping block. “It would get [Lolly] fired up,” Frost said. Lolly decided she would save the library. Her first idea included drawing fliers and selling chicken eggs, but in December 2012, she found a better way. “She got this little cookie factory for Christmas and she said she could save the libraries with cookies . . . and she started calling up people taking orders,” Frost said. Lolly didn’t charge for her cookies—she instead asked for donations to the library and together, she and her mother packed orders and delivered them around Drain in Douglas County. The effort raised nearly $5,000, and Lolly’s money saved the children’s program that year, but it couldn’t keep the library safe forever. The commission had front-loaded the budget in 2015–16 in the hope that voters would approve the tax levy to keep the library system open. 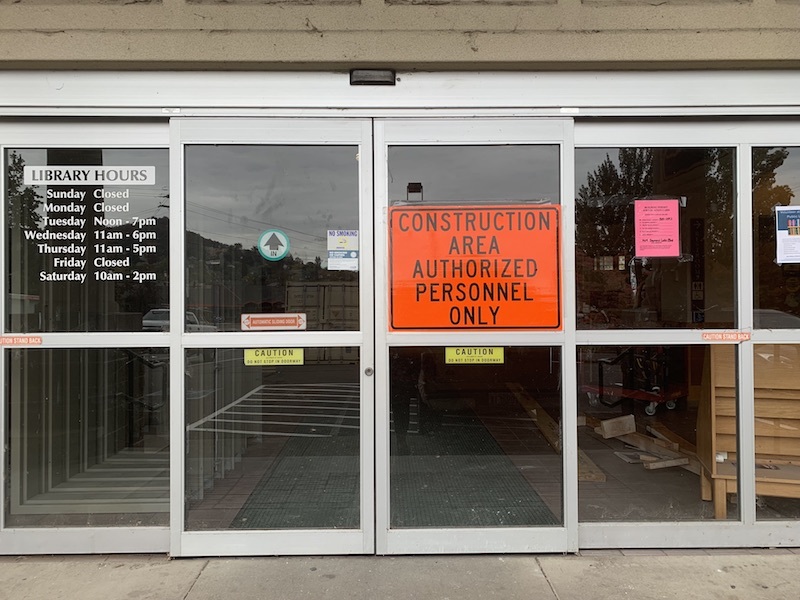 But when the measure died, so did the system, and one by one the libraries closed until the main branch in Roseburg shut its doors on May 31, 2017. It marked the end of a sixty-one-year effort by residents and local government alike to continue providing the community with a public library. Many municipalities have met similar fates as costs climb, revenue falls, and cuts empty the lifeblood of the community out onto Main Street. In 2017, almost two centuries since the conception of the first public library, the singed breezes of an unusually warm summer in Douglas County gave way to the reds and oranges and yellows of a country autumn. Supporters in all eleven libraries—facing the impending death of the countywide system—were toiling away: cataloging books, driving hours to retrieve their repossessed public computers, and trying to make sense of the complicated process of managing tax money as newly elected officials. Many were now in charge of the libraries they tried to save, because when the 2016 levy—Ballot Measure 10-145—was grounded, public support soared and the libraries found their way through the politics to reopen on their own terms. The return of the public library in Douglas County (population 109,405) however, wasn’t a united effort, missing the support of the system it had had for more than six decades. The libraries’ reopenings were a new reality built on the false hope of sustainable volunteer forces, revealing the hushed conflicts that splintered services and, in some cases, called the future of Douglas County’s libraries into question. In Douglas County, the timber industry has been living on borrowed time for more than a decade. The Oregon and California Railroad and Coos Bay Wagon Road Grant Lands Act of 1937 classified land in the two states as federal timber land and mandated sustained yield forest management. It also required that 50 percent of the receipts from the sale of timber be distributed to eighteen counties containing Oregon and California (O&C) land—including Douglas County. Between 1953 and 1981, counties received more than $340 million. In 1981 Douglas County created the Douglas County Library Foundation (DCLF) with a $2 million endowment aimed at assisting the eleven libraries. But as environmental concerns increased and the timber industry grew more regulated, payments decreased and Douglas County began operating under the protection of the safety net—funds set aside under the Secure Rural Schools program to ease the impact of decreasing timber funds. With diminished funding from timber sales and no new sources coming, the cost of running the library kept rising, even with continued budget cuts. By 2006, the county was operating the library system on a limited budget. Only three full-time employees were budgeted for the library’s administration and the equivalent of eleven full-time branch employees were budgeted for the entire system. Personnel expenses had reached $2,272,246, up nearly $300,000 from the previous fiscal year and the system’s expenditures were soaring. In 2008, the cuts came, 10 percent a year through 2010. By the time the ballot measure failed six years later, the Drain Library’s hours had been cut back to twenty-four hours a week. In 2016, the county had set the 2017 budget at $1,354,398 which included a general fund contribution of just over $620,000. The county opted to spend the majority of the budget in the first half of the fiscal year, assuming Ballot Measure 10-145 would pass in the fall of 2016. When all but three communities—Drain, Reedsport and Roseburg—voted against the measure, the system lost its chance at long-term funding. Leif took office in January 2017 as the third Douglas County Commissioner and became the liaison to the library. Some library supporters in the county say he stepped in and created the Library Futures Task Force. Others say library supporters went to the commission, hat in hand, for a solution after Measure 10-145 failed and Leif was assigned to help. The success of the task force has been jotted down in library supporters’ memories with a divided hand, similar to the division of support for the library around the county. The board was made up of people representing towns from around the county where the levy had passed (Reedsport, Roseburg, and Drain) and where it had failed (Yoncalla, Winston, Oakland, Myrtle Creek, Riddle, Canyonville, and Glendale) and where it hadn’t even been allowed on the ballot (Sutherlin). There were city representatives, library supporters, and, in some cases, library opponents. They met for nine months arguing over who owned the 150,000 books in the countywide collection and how they would fund their operations or if they would continue on as a system no longer supported by the county. In the end, the only things that came out of the Libraries Futures Task Force were more confusion and the controversial Douglas Community Library Association (DCLA). The DCLA went to each library and gave a presentation, citing the need to remain a county-wide resource. They would provide the outlet for the libraries to work under the same IT system, grant access to Library2Go—an e-reader program—and by signing the contract DCLA offered, libraries would be given free access to the books housed at other DCLA-signed libraries. Currently, Canyonville, Myrtle Creek, Glendale, Oakland, Riddle, and Winston have signed on. Sutherlin and Yoncalla have representatives on the DCLA board but are not officially member libraries (Sutherlin has a legal question about the contract). Reedsport has yet to sign on, having passed its own levy. Roseburg has also passed a levy to fund its library. 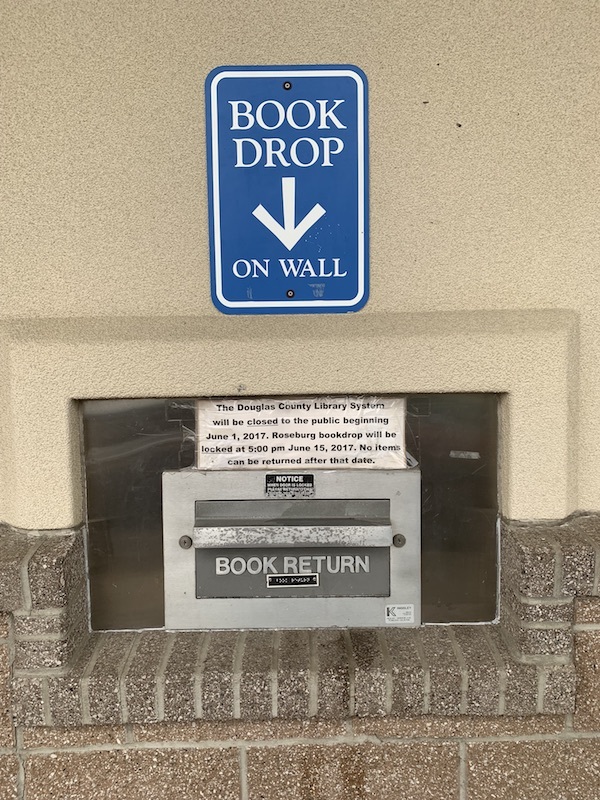 “The city [of Roseburg] insisted on ownership of the inventory of books and it’s the largest library, so it had the largest inventory, and so far, Roseburg is saying that it will share books but if you don’t live in Roseburg, you have to pay a fee to get a library card. That’s a political decision and that’s part of the problem,” said Ripley. Yoncalla’s city council was set to vote on whether or not to allow the library to enter into a contract with the DCLA at the start of November. Drain has also opted not to join the DCLA. 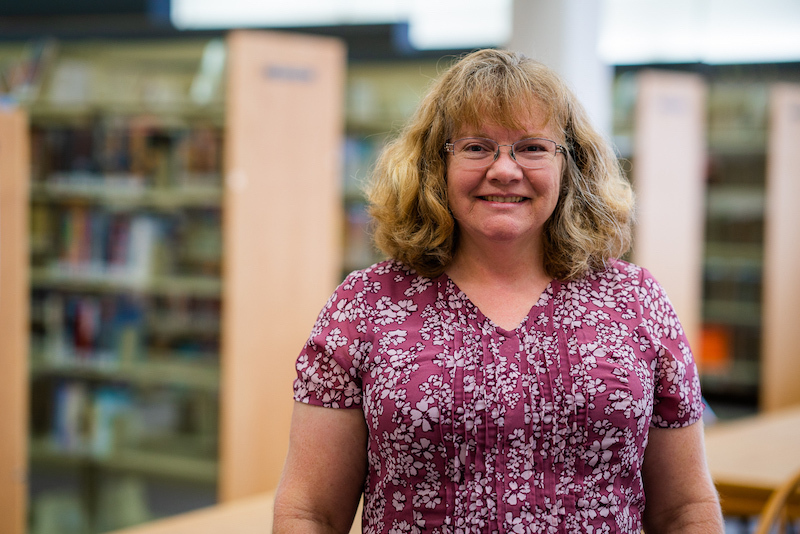 Valarie Johns was also elected to the North Douglas Library District Board and had previously worked as Drain’s librarian before leaving to take a job with more hours at Cottage Grove’s library (due to the continued cutback of hours implemented by Douglas County’s dwindling budget). 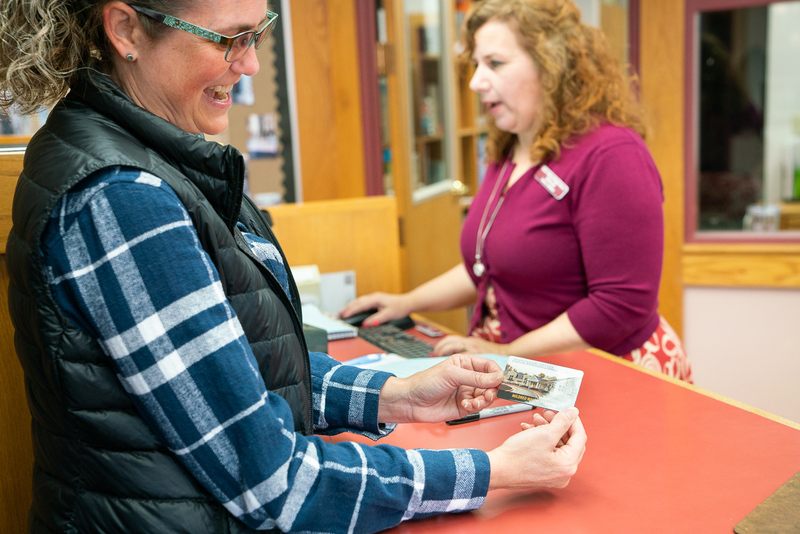 Prior to the 2016 vote, Cottage Grove Community Library—approximately thirty minutes from Drain— had ten library card holders from Douglas County. After the final Douglas County library closed in June of 2017, it had seventy-three card holders. Part of that confusion may be because of another loss for Douglas County—a local news source. Just past the information desk through a series of doors, the crooked corners and hallways of rooms vying for space in buildings meant to hold the past, not accommodate the future, there is a stack of boxes that rest on the heads of cabinets not quite brushing against the ceiling. There are newspapers there too, the most complete set of the weekly Drain Enterprises anywhere in the world, chronicling business openings and highway fatalities. 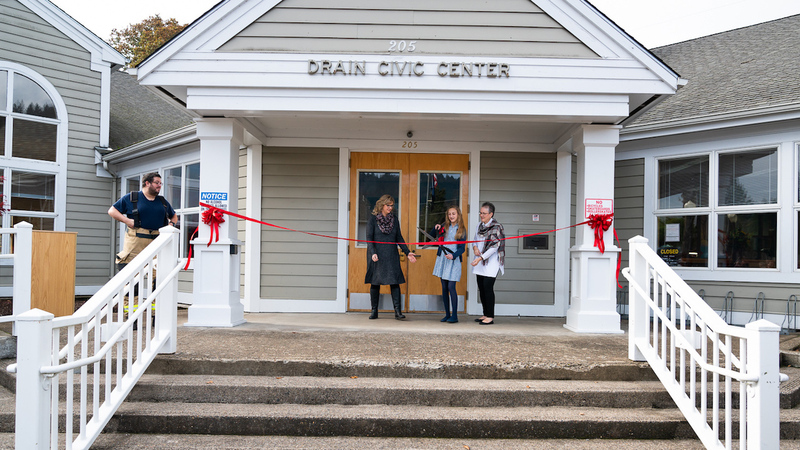 When Enterprise Editor and Drain Mayor Sue Anderson grew ill and closed her one-woman First Street operation in 2015, there were no more headlines for Drain, in Drain. When the library closed its door on April 1, there was no local Page 1 to hold the wake. A 2018 study by the University of North Carolina’s School of Media and Journalism reported that more than 1,300 communities have lost all of their local news coverage because of buy-outs, closeouts, and mergers. In March of 2007, Beacon Communications launched The Winston Reporter, the first local newspaper in Winston, Oregon, in more than a year. It joined the three newspapers that serve the eleven communities in the Douglas County Library System. The Winston Reporter is no longer in print. 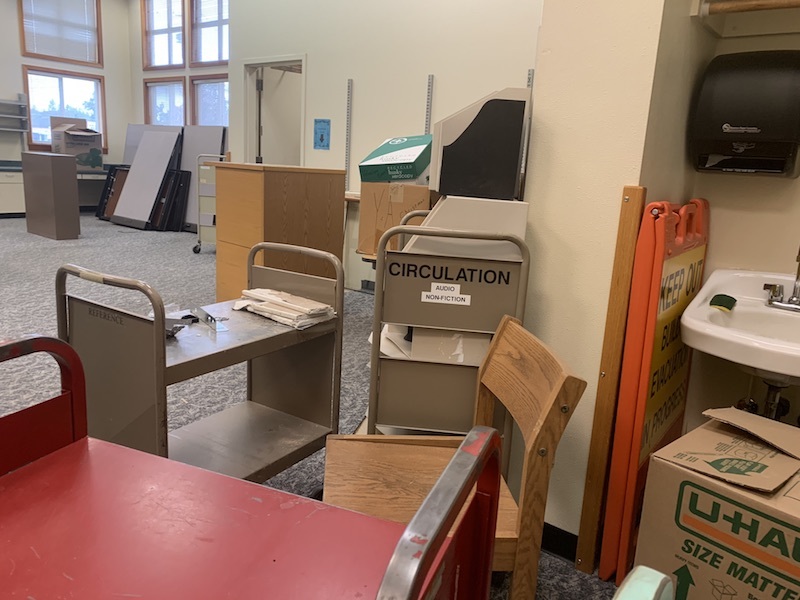 The News-Review published more than a dozen stories before and after the closures but according to the paper’s editorial staff, they have only covered the library sporadically and haven’t returned to Drain since May of this year. Up north, however, in locations like Drain and Yoncalla, outreach didn’t stretch as far and while emails and phone calls crossed the border between north and south Douglas County, tabling efforts were sparse. Calls from out-of-town news sources, however, were not. The New York Times covered the story, linking it to an “anti-tax” sentiment felt in places around the country since the 2016 presidential election. Then, the documentary crew arrived. “The Douglas County story, we were following this one thing for a while,” said Lucie Faulknor, a producer on the film, Free for All, which explores the role of libraries in America. Work on the film started in 2008, prompted by the financial crash; the film is set to be released in 2019. “A lot of libraries were closing when municipalities had to decide between fire and police and libraries, unfortunately, a lot of them had drastically reduced hours or were closed so we were aware funding was a problem and that people didn’t realize and, well, you know what happened,” she said. The crew was onsite for the last day Myrtle Creek Library was operational under the county system in 2017. Faulknor said there were no immediate plans to return to Douglas County. When the doors to all the libraries were closed by the county, some swung back open through volunteer effort. Sutherlin, which had opted not to take part in the 2016 ballot measure, is run by volunteers and never closed. Myrtle Creek was operational again within three months with the help of Robert Heilman, who drove his pickup to Roseburg to retrieve Myrtle Creek’s repossessed library computers from county officials, and volunteers who signed up to staff the library. 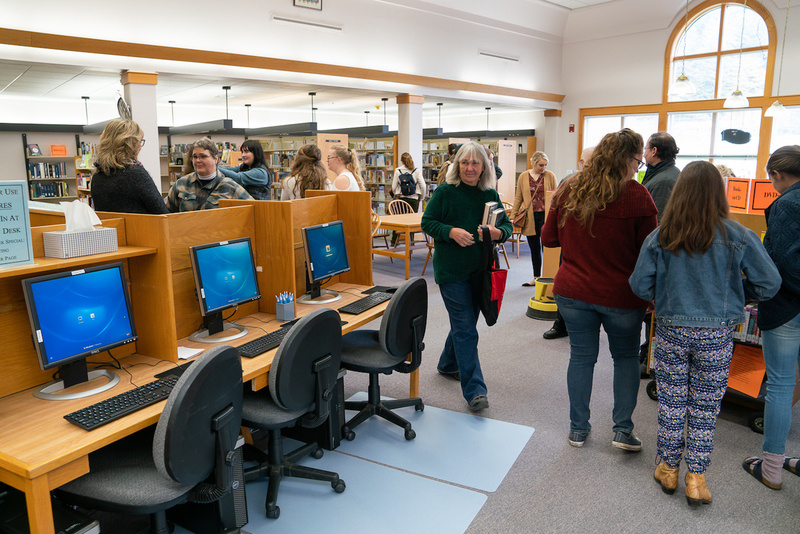 Canyonville and Yoncalla also opened shop with volunteers and in the six weeks leading up to its grand opening, the Mildred Whipple Library saw more than one thousand volunteer hours clocked. “They’re tired,” Heilman said in the waning days of summer. This sentiment was echoed by the library board in Drain, the administration in Winston, and the new librarian in Roseburg. They money is also running out. The city of Myrtle Creek allows the library to operate in the same building but the agreement it signed with the group removes the city from the operation all together. To pay for the yearly insurance costs, the library volunteers collect cans and bottles and rely on donations. In fact, the only libraries in the county to have a steady, stable income are the ones that remained closed the longest after the shutdown: Roseburg, Reedsport, and Drain. In October 2018, Roseburg was readying to open its doors for the first time since they closed in June the year before. The building was undergoing a renovation that would divide it between the city and the Douglas Education Service District and was being overseen by new librarian whose position was funded by the city. There are no new taxes in Roseburg, but according to city manager Lance Colley, the new budget can support the library, and local donations and help from the Cow Creek Tribe and Meyer Memorial Trust supported its $750,000 renovation budget. The Roseburg City Library is set to be open twenty-four hours a week. Douglas County residents who live outside of Roseburg city limits can still obtain a library card—for $60. Reedsport and Drain passed levies to fund their libraries and even though these communities are far ahead of the remaining Douglas communities in the race to have a stable community library, they have still submitted requests to old friends for help. The Douglas County Library Foundation’s $2 million initial endowment was meant to help libraries purchase books, improve technology, and fund various other library-specific projects. According to Ripley, the DCLF typically distributes $40,000 to the libraries around the county. This year, requests total $82,000. “They’re not all going to fly,” he said. “Reedsport wants $15,000 for a computer system, Roseburg is asking for $37,000 for book inventory and they probably need it. We have about $80,000 in the bank over the $2 million endowment but if we’re going to increase the endowment we still don’t want to spend all of that.” Fulfilling all those requests would not only require spending all the endowment’s earnings, but the endowment itself, which wouldn’t help it grow, said Ripley. On October 10, 2018, there wasn’t a sign of the heat that had plagued Douglas County all summer. The group gathered outside the Mildred Whipple Library in Drain did so in sweatshirts and coats, some with scarves and others in sweaters. The black and white dog that belonged to a house down the road gave off visible puffs of breath as it panted and snaked and trotted its way through the crowd waiting for Mayor Justin Cobb to arrive. The Mayor, also, a first responder, had been delayed by an accident on Highway 38 and in his absence, board members for the North Douglas Library District Board chatted with the sixty or so community members who had waited twenty months to see their library open again. When Cobb arrived, a cheer went up and for the next thirty minutes it hardly subsided as Anne Campbell took to the podium and recalled how the library had moved from church to city hall to the building Mildred Whipple helped fund. She introduced Lolly Frost, now a teen, as the official ribbon cutter and chronicled her second-grade year selling cookies. She cited the stats: the May 2018 levy asking Drain voters to tax themselves the same 44 cents per $1,000 of assessed value to reopen the library had passed by more than 75 percent. Twenty-one volunteers spent 743 hours in 30 days to clean and recatalog 6,000 books in the hopes of reissuing hundreds of library cards. Running a small newsroom meant sorting through hundreds of emails a day and picking out the dozens of press releases from communities within a fifty-mile radius. It was sometime last year that I got a notice from the Friends of the Mildred Whipple Library—they wanted their library back. When the Emerging Journalists, Community Stories fellowship opportunity landed in my email, I immediately thought of the folks in Drain. I didn’t have the resources at the small publication I worked at to pursue the story but with the fellowship and guidance from my mentor Les Zaitz, I could. For five months or so, I stole hours between production and editorial responsibilities to drive around Douglas County. I spoke with library boards, library supporters, librarians and people who had voted for and against the library levy. It was their story to tell, I just wanted to write it down. Caitlyn May became a journalist by accident. A corrections center was being built in the center of her town, so she wrote a letter to the editor of the local newspaper that sparked a career. 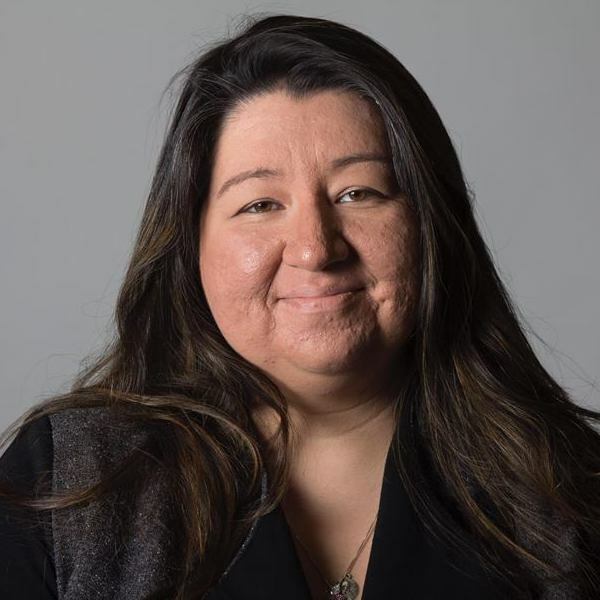 After graduating from the University of Oregon School of Journalism and Communication in 2016, she opted to invest in a small, rural community and served as editor of the Cottage Grove Sentinel with a focus on media literacy, community engagement, and digital inclusion. She recently left her post to accept a job as a city and education reporter for the Albany Democrat Herald in Linn County, Oregon. What a clear and thorough story about a very serious topic. Bravo, Caitlyn! And thank you Oregon Humanities for hosting this complete story.